2018 Team of the Year Award – A cross-functional team of employees from OCWA’s operations, distribution and engineering departments worked cooperatively to design and construct a complete overhaul of the Authority’s Academy Hill pumping station in Manlius. 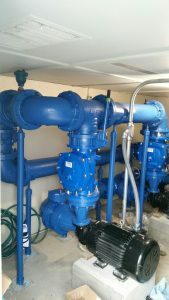 The project included replacing the piping, valves, and pumps at the station with new, larger and better arranged components. This was the largest ever design-build project completed exclusively in-house by OCWA. The end result was higher capacity, greater discharge head and an overall reduction in energy usage at the station. 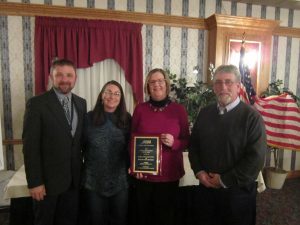 2018 Environmental Project of the Year Award – As a result of a portion of OCWA’s Otisco Lake water transmission main becoming exposed at a large bend along Nine Mile Creek in Camillus, OCWA worked with Barton & Loguidice, NYSDEC, the Army Corp of Engineers and CNY Land Trust to develop creek bank restoration designs that protected the main, while also meeting environmental requirements applicable to the adjacent creek and wetlands. Through the skillful construction of D.E. Tarolli in very challenging conditions restricted by the creek and a rail line embankment, the project was completed on time and under budget. It is the largest and most complex transmission main stabilization project performed by OCWA along Nine Mile Creek to-date. 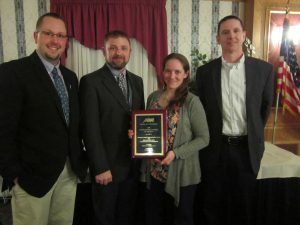 Photo caption (left to right): Andrew Weiss (OCWA), Joe Wisinski (APWA), Johanna Duffy (B&L), and Greg Mosure (B&L). 2018 Structures Project of the Year – OCWA replaced an outdated, manual water meter testing facility with a state-of-the-art system that provides better accuracy, automation, simultaneous testing, water conservation and employee safety. The new facility utilizes a combination of both a test bench for multiple smaller meters and a large bench for meters up to 10 inches, with an overhead crane to lift large meters into place. A new computerized testing system includes a gravimetric weight scale for accuracy with an automated data and controls system for simultaneous recording of meter performance. The system also uses a water recycling and re-circulation system to significantly reduce water use. The new facility is capable of testing significantly more meters each year while maintaining industry leading accuracy and quality control. Photo caption (left to right): Joe Wisinski (APWA), Debbie Owens (OCWA), Sue Weaver (B&L), and Tim Tenecyk (OCWA).